Sometimes all you want in life is a massive choice of food. 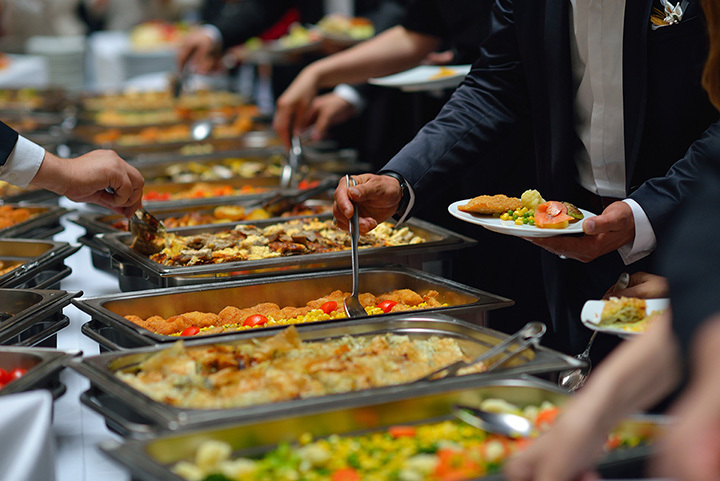 The concept of an all-you-can-eat buffet was started in Sweden to feed hungry out-of-town guests and was later brought to the United States during the 1939 World’s Fair in New York. In the foodie state of Maine, you know we’ve got some incredible buffet options. From lounges with incredible spreads of Asian cuisine, to inexpensive all-you-can-eat options at local colleges, these 10 buffets are among the very best! The Southern Maine Community College (SMCC) Oceanview Dining Hall is open to the public. With incredible views of the ocean and Casco Bay, you can enjoy an all-you-can-eat buffet for under $7. The dining hall is open for breakfast, lunch, and dinner and has a wide variety of foods that change throughout the week. You can check the menu online to see what’s on the menu for the day. Serving a mixture of Chinese, Japanese, and Thai dishes, you can mix and match to your heart’s content at East Restaurant Lounge’s Sunday Brunch. Choose from the lunch buffet from 12 p.m. to 3 p.m. or the dinner buffet from 3 p.m. to closing. If you’ve ever wanted to try different Asian dishes, this is a great opportunity to do so without paying a ton of money for something you don’t end up liking. Open to the public for $16.95 per person, but complimentary for hotel guests, the Breakfast Buffet is an excellent value at the Harraseeket Inn in Freeport. Open daily from 7 a.m. to 10:30 a.m., the Breakfast Buffet has everything from homemade pancakes and French toast to Winter Hill yogurt and freshly baked muffins and bread. And, you can order eggs anyway you like them. The Oxford Casino has a variety of buffet meals throughout the week, including the Prime Rib Buffet every Friday night from 5 p.m. to 10 p.m. For $21.95 per person, you can choose prime rib, turkey, or ham plus tons of other salads, pasta, entrees, and desserts. There is a Thursday Lunch Buffet that is free if you score 100 Tier Points by noon. And, don’t miss their famous Sunday Breakfast buffet with all your favorites and more. Operating in the area for over 16 years, the Super Great Wall Buffet is one of the original Asian buffets in Southern Maine offering a choice of Chinese and sushi. With over 200 items to choose from, you’ll find all your traditional Chinese favorites and more. There is now sushi and a Hibachi Grill at lunchtime for even more choices. The “Epic Buffet” at Hollywood Casino in Bangor is open Friday and Saturday for dinner and Sunday morning for brunch. The buffet has a large selection of all your favorite foods including prime rib and crab legs. Children are allowed in the dining area of the casino and can eat for half price. Hibachi Supreme Buffet is one of the best buffets in the Central Maine region. Open daily except on Tuesdays, the food is hot, the restaurant is clean, and the staff is attentive. The buffet menu has an excellent selection of Chinese and American dishes and you can even host large parties and events here. If you’re craving pizza then head over to Ricettas in Falmouth for their lunchtime pizza buffet. From 11:30 a.m. to 3 p.m. you can enjoy eating an endless amount of delicious thin crust pizza. You’ll find all your traditional favorites like cheese and pepperoni plus their specialty pizzas. Don’t forget to try a cannoli or two before you leave. Located in Auburn, Panda Garden has been serving Chinese and Asian cuisine for over seven years. Their popular lunch buffet is available Monday through Saturday and their dinner buffet is available Friday and Saturday night. There is free Wi-Fi and the Polynesian drinks are quite tasty. Located in Sanford, Bonanza Steakhouse has been serving up steaks and other local favorites since 1984. The lunchtime lunch bar buffest is available Monday through Friday with a changing daily menu which you can find online. You’ll find a variety of soups, meats, vegetables, and desserts.